This is the first all island joint SBIR between Dublin and Belfast. Dublin City Council and Belfast City Council seek smart, low cost solutions to optimise freight and cargo deliveries in urban centres. The changing nature of urban economies and supply chain management, and the impact of online retail has had an impact on the type and volume of goods deliveries in city centres. This in turn has had an impact on the wider urban environment in terms of air quality, traffic management and infrastructure. Both cities are looking for ways to enhance the efficiency and effectiveness of deliveries, reducing the number of goods vehicles in their respective urban centres, which in turn will improve air quality, noise pollution and road safety. This needs to be achieved in a way that minimises the financial impact to business in both cities. 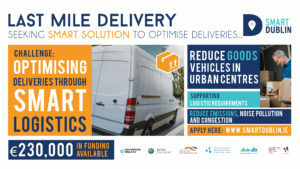 “Dublin City Council is seeking innovative ideas and solutions to address the last mile delivery challenge in a way that can help reduce congestion, improve air quality and make for safer deliveries in the city centre. The SBIR process offers a unique opportunity for entrepreneurs to work alongside business to test new approaches to city logistics and deliveries piloting solutions across key city centre sites. We are also delighted to partner with Belfast City Council on this challenge to offer a second reference site to the successful companies” – Colm Ennis – Senior Executive Engineer -Dublin City Council. The closing date for applications has been extended by an additional week to the 25th June at noon. Click here to see the Invitation to Tender – reference number RFT 133123. There were two briefing sessions for all prospective applicants in Dublin on the 15th of May and Belfast on the 17th of May. They provided the opportunity to discuss the requirements of the brief with Smart Dublin, Belfast City Council and Enterprise Ireland. See the presentations below.